God has laid on Jeremy's heart to "speak louder" to this generation, making the gospel clear and calling Christians to speak up, speak out, and speak now! This set includes the original CD plus a multi-featured DVD. 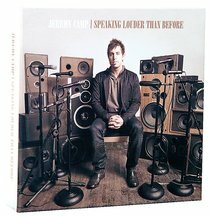 About "Speaking Louder Than Before (Cd/dvd Special Edition)"
Customer Reviews For "Speaking Louder Than Before (Cd/dvd Special Edition)"